From the defenders’ perspective it's Straw Dogs. After boarding up doorways and unfurling barbed wire under windows there’s nothing to do but listen to the distant crunch of boots on glass, a growing series of muffled bangs, heavy breathing, and worst of all, silence. For the attackers it's more DIY SAS as they bring out sledgehammers, set explosives, and prepare for breach. Then all hell breaks loose. That’s the setup for Hostage Rescue, a competitive, round-based online mode in which one five-person team must protect a sad-faced NPC from another who want to steal him. There are three main modes in Ubisoft’s multiplayer focused shooter - alone against loads of AI enemies, with four mates against loads of AI enemies, or in five-on-five multiplayer - and the one constant is highly detailed interiors where players poke through floors, smash ceilings, and blow holes in walls. Hostage Rescue, though, feels like Siege’s centre. Strafe-filled dances of death are replaced by grinding wars of attrition with people prone on belly or back peeking out from behind a bookshelf or pool table in efforts to present the smallest target possible. Actual encounters are short and sharp. Here the first person to shoot is often the victor - strategy comes in getting to that position in the first place by cycling through CCTV cameras placed around the environment, watching for shadows under door frames, or improvising peepholes in drywall to keep tabs on opponents. Micro-destructible buildings opening up bit by bit - rather than collapsing wholesale - results in an unpredictable experience where, despite close confines, threats come from anywhere.There's not much space to move but there's plenty of space to think. It’s almost like each room of the biker clubhouse, presidential plane, downtown bank, military base, middle-class suburban dwelling and more is a level in itself, since every three-minute round presents a different scenario. You can buy garish weapon skins, XP boosts, and operators with either cash or in-game credits. As an example of value, a three-day XP boost costs 350 credits, and an operator costs 1000 credits (each time you unlock an operator the price of the next one increases), and a pack of 1200 credits costs £7.99. Although you can earn credits through play, operators are expensive, and after ten hours I had only unlocked a quarter of them. On top of an optional £25 season pass giving access to new operators, maps, and skins coming over the next year, it feels a lot on top of a full-priced game. One sees my team hunker behind cars and power tools in a garage, cutting off the stairway with poison gas in order to funnel attackers through a route we have our sights trained on. In another we place electrified barbed wire under second floor windows so rappelling invaders suffer damage upon entry then crouch in cupboards and showers. Later, as attackers this time, I bang on walls to attract attention while my teammates storm through the ceiling. Randomised hostage locations demand a new approach each time, while a day/night options alter the atmosphere. That randomness sometimes goes too far as you’re prevented from picking a specific mode or map. Want a few rounds on your favourite stage? Too bad you don’t get a choice - and there’s not even opportunity to vote. Also, with such small margins of error and even smaller targets, it's a shame hit detection is so spotty. The killcam has shown me being shot by people I couldn’t see, and dying without being shot at all. Inconsistency means sometimes you'll bite the bullet even before warning damage indicators show on screen, despite the kill cam showing your killer peppering you with shots. An exacting game demands exacting mechanics, but Siege needs work in this regard. You can vent frustrations on waves of computer-controlled terrorists in co-op mode Terrorist Hunt, a murderous counterpoint to the multiplayer’s slow burn. Here your five-person team has to infiltrate a location and disarm a bomb, extract a hostage, or just straight up kill dozens upon dozens of very bad men. It’s all about creeping through passages with four operators in tow, peeking out from the scratched viewing slit of a ballistic shield or looking down a trembling reflex sight to scan for signs of movement. One foggy level set on a campus in the immediate aftermath of a poison gas attack makes you tackle the challenge at walking pace in case you charge head first into a pack of bad guys, but it’s a thrill regardless as you travel down channels together in one cohesive unit like sink unblocker, cleansing them of terrorist scum. Always having a man at your back gives the game a strong sense of teamwork. Indeed, Siege is multiplayer through and through. Purely single-player options are limited to ten five-minute missions that act more like tutorials. There’s one in which you use a virtual reality sight to identify bombs in an Oregon compound and another where you snipe terrorists in a Hamburg dock, but its meagre length (you can complete everything in an hour) means an almost complete absence of appeal for lone wolves. No, this is all about the interplay between classes across online competitive modes and co-op. Each operator has a unique skill, and there are 20 at launch. Examples include Fuze, who fires cluster grenades through walls, Sledge, who bashes them down with a hammer, Blitz and his flashbang riot shield, and Doc, who revives from distance with a syringe gun. Soon come clever strategies such as erecting shields in doorways the enemy must hop over, parking your RC drone in corners to keep tabs on opponents, and shooting out windows to freak out opponents. Annoyingly, you have to pay to unlock these operators (see ‘Microtransaction Infraction’ above). Yes, you can earn currency through play, but the slow rate of accumulation pushes you towards coughing up cash. Skins and XP boosts are one thing, and Siege has those in abundance, but asking extra money for non-cosmetics such as classes - whether that currency is in-game or actual - feels greedy. You could make the argument they’re shortcuts, but why? This is already a full-priced game. 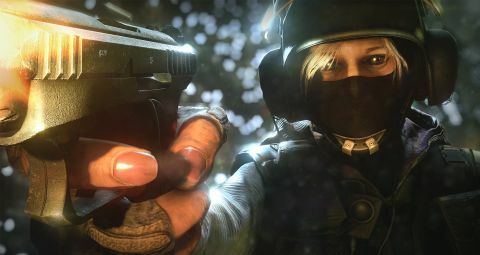 Lacking a campaign and largely multiplayer-only, the first Rainbow Six game in five years offers something unique. In the same way Forza teaches you about apexes, and IL-2 Sturmovik instructs you on the Immelmann Manoeuvre, this schools you in SWAT without feeling like a dry sim. Techniques applicable in a hostage situation apply here: check your corners, present the smallest target possible, and deploy whatever personalised hardware you can get your hands on. Rainbow Six Siege’s calculating, climactic confrontations feel fresh in a genre mostly concerned with movement. You’re less headbutting ram and more coiled snake here. Microtransactions and a lack of singleplayer activities count against it, but there’s nothing quite like laying a laser tripwire over a window, crouching in a cupboard, and waiting to pounce on the next person through it. This game was reviewed on PC at a review event. Description Rainbow Six is back to stop the bad guys and this time for good.